Herb Smith and I will appear with Vyzygoth on "Beyond the Grassy Knoll" this Friday at 11 PM Eastern. Stream from this page, and feel free to phone in on the new Caller Line, or email Vyz during the show. It'll be a fun show (and I'll be warmed up from doing my first live RADIOLA! on WHCL in ten weeks). I haven't had a chance to watch it yet, but here is the long-awaited and much-promoted Final Cut of Loose Change. (Thanks to Joe C.) Reviews, criticisms, and other opinions regarding this video may be posted below in our comments section. Buildings do fall vertically like Building 7, when destroyed by controlled demolition. The controlled demolition of large structures is a well developed art and science. Removing a tall building from an urban landscape without damaging adjacent structures -- a considerable engineering feat -- is a task that only a handful of controlled demolitions companies specialize in. One such company is Controlled Demolition Inc., which, incidentally, was subcontracted by Tully Construction to coordinate the removal of rubble from Ground Zero and the disposal of the structural steel in the months following the attack. The steel skeletons of buildings like WTC 7 are extremely robust. They are designed to withstand earthquakes and hurricanes, and are over-engineered to handle several times the maximum loads anticipated during their lifetimes. Such steel skeletons have local structural integrity. An event that destroyed one portion of the structure would not cause distant portions to shatter. If some force obliterated the load-bearing columns well below the top of a 600-foot tall skyscraper, the top of the building would topple like a tree, not smash its way down through intact floors and into its foundation. Controlled demolition destroys vertical steel structures while overcoming their tendency to topple onto adjacent real-estate. It does so by shattering the steel skeleton through the precisely timed detonation of explosive charges. Demolitions are large undertakings with high stakes. The number of charges required is at least the number of columns times some fraction of the number of floors. An error in timing of the detonations could cause expensive collateral damage. Building 7's documented vertical plunge and tidy rubble pile with exterior wall fragments on top are exactly the kinds of results that controlled demolitions achieve through careful engineering. The survival of several video recordings of Building 7's collapse, though of low resolution, allow study of the building's motion and the time of collapse. Each of the following videos shows the entire visible portion of the building falling with a vertical precision otherwise seen only in controlled demolition. Moreover, they show that the collapse took only about 6.5 seconds from start to finish. That rate of fall is within a second of the time it would take an object to fall from the building's roof with no air resistance. LOCAL CORPORATE MEDIA ENDORSES PRESENTATION BY UTICANS FOR 9/11 TRUTH! David Dancy, who writes for the Life and Times of Utica (owned by the Journal-Register Company) has published his essay regarding our September 2007 presentation in Utica. This appears on the editorial page of the weekly, and we consider it a formal editorial endorsement not only of Herb Smith's excellent program, but also of all those who dare to question the Official Story of 9/11. 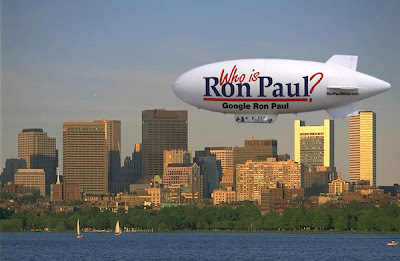 Now that Ron Paul has dropped out of the Presidential race, and Les Paul (despite our importunings) could not be persuaded to run, The Uticans for 9/11 Truth have decided to throw our full and unconditional support behind inventor Ron Popeil. Second only to Edison in his brilliance and impact on our daily lives, Ron Popeil is the next obvious and logical choice to lead this country. Not only will he make America work again, he'll make it work for only $39.95. That's right--just $39.95! But wait--there's more! If you join the Popeil for America effort today, you'll also get the amazing Kitchen Politician! He slices! He dices! He cuts taxes as easy as one-two-three! Don't delay! Call 1-800-VOTERON today! 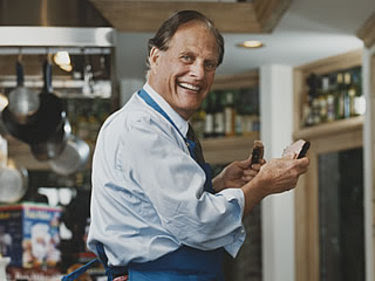 UPDATE: As evidenced below, Ron Popeil has already done more for us than any other candidate. 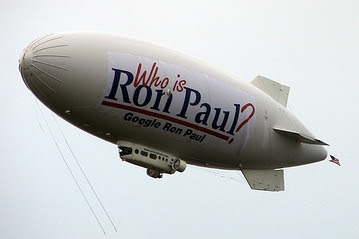 FOR SALE: ONE BLIMP, CHEAP! Or so it would seem. Even Fintan Dunne has returned from his tour of neighboring planets to address the deflation of the airship with some clarity. High-bitrate audio, with plenty of Dunne's usual raw language, HERE. UPDATE: Oh, shut up! SHUT UP! SHUT UP!! Fool me once (redux). . . I was listening to my friend Pete Bianco's WHCL radio program this morning, and his guest over the course of three hours was David B. Dancy, who spoke intelligently and entertainingly on many topics. The topic turned to 9/11, and it turns out that David Dancy attended our September 24, 2007 presentation and wrote a compelling post on the topic HERE. The comments, particularly the remarks of a persistent shill, are revealing. Pete, by the way, has helped with many of our public events, and set up the presentation at The Other Side. This is no surprise at all--and springing this right before Stupid Tuesday was timed with Swiss Army Watch accuracy. In addition to hawking his book on Fresh Air Monday, Shenon appeared on the Diane Rehm Show today. What we have to realize is that we don't have a monkey wrench big enough to throw into the works--and that such "revelations" as Shenon offers are part of the works. Anthony Lawson, who did "This Is An Orange," offers his critique on "September Clues"--he appears on this program to discuss the (non) validity of no-plane theories. There is no safe haven from mendacity in the 9/11 business. Obviously, we have to get back to basics (such as discrediting the Official Story) and jettison all the frilly bits, whatever their seeming plausibility. Vyzygoth's new internet radio venture, "Beyond the Grassy Knoll" is now up and running. 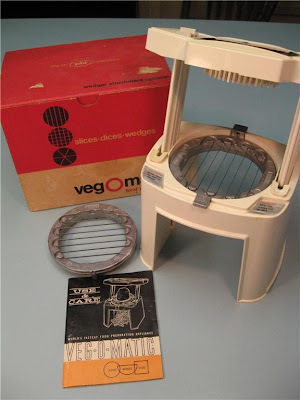 Programs may be streamed in a variety of formats from this page. Welcome back, Vyz!